Here is a wonderfully decorated antique mantle clock with bronze statuary. A winged angle gestures toward heaven along with a small girl with hands folded in prayer. At the center is a clock with Roman numerals. The base of the clock is decorated with floral scrolls and leaf engravings. The vertical lines of the pedestal are continued by the body positions of the statues, completing a visual triangle with the angel’s finger at the top. 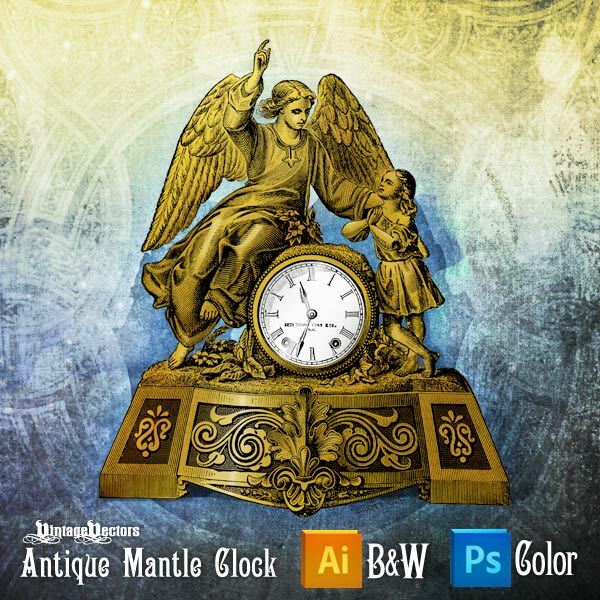 This free mantle clock illustration download includes a black and white vector and a hand-colored high resolution PSD with transparent background for drag and drop convenience. Oh, yeah! This turned out beautifully! Thanks, Eric! i want the background plzzzzzz!!!! !